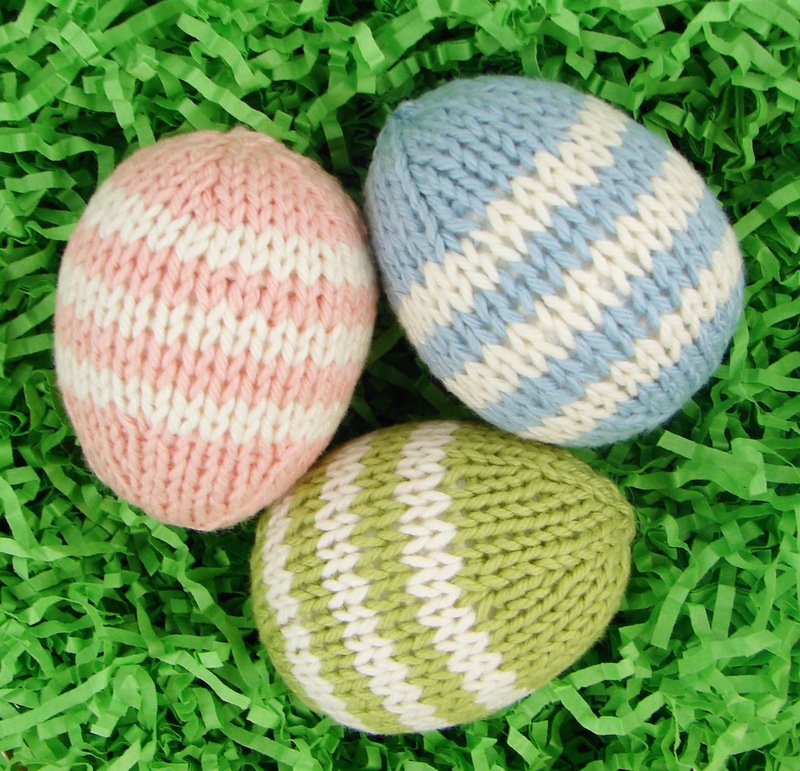 These adorable eggs are quick and easy to knit. 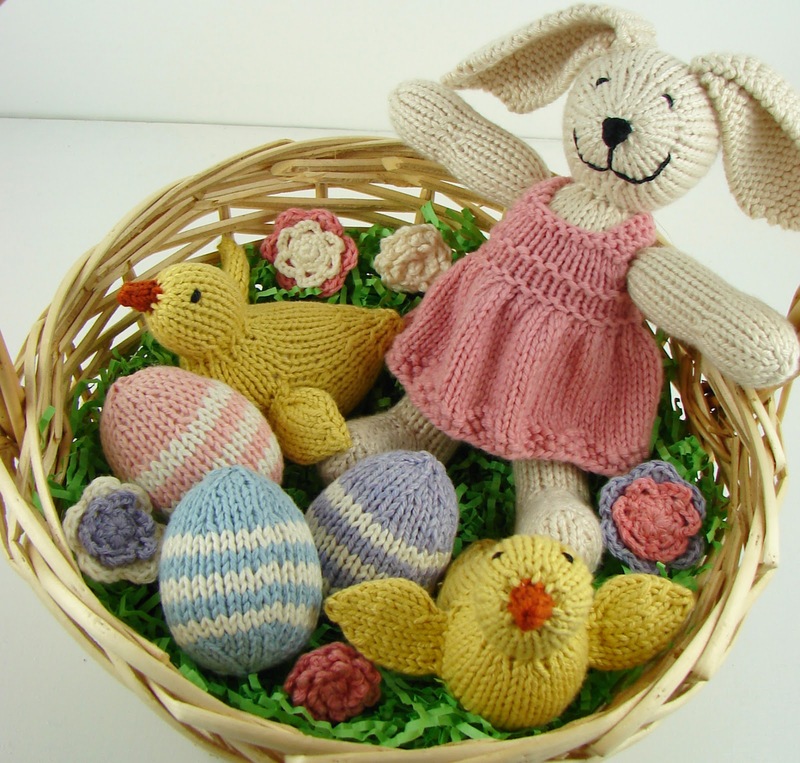 They use very little yarn which makes them a great stash buster project. Each finished egg measures about 2.5 inches long and about 6 inches around. 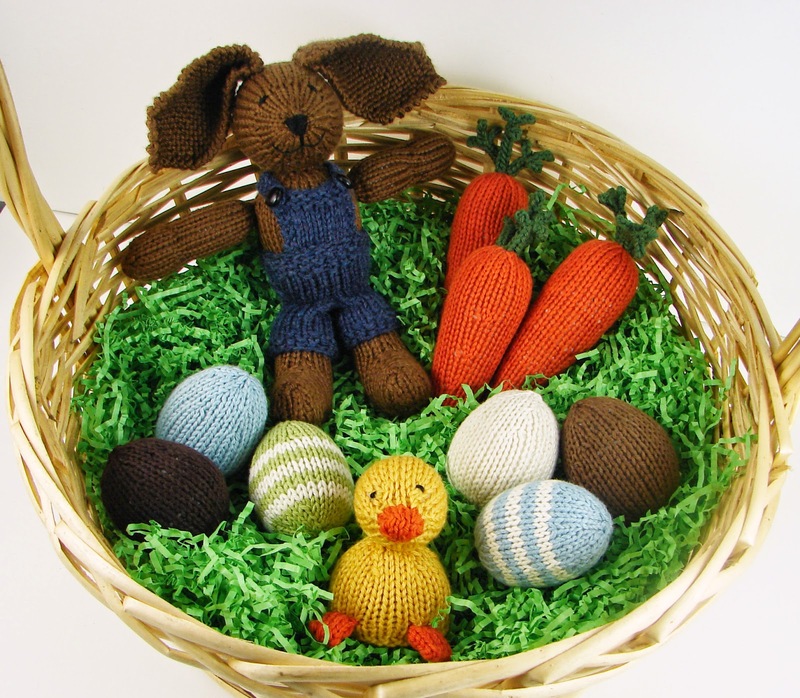 They make great Easter basket stuffers, decorations, or toys. Enjoy! K2tog- Knit two stitches together. RLI- Right lifted increase. To work the RLI increase, lift right leg of the stitch below the next stitch up onto the left hand needle. Knit the lifted stitch and the stich that was above it to complete the increase. Note: If you would rather work the KFB (knit in the front and back of the stitch) instead of the RLI (right lifted increase), simply replace all RLIs with KFBs. I prefer the RLI because it mirrors the K2tog decrease nicely. With main color, CO 6 sts across three DPNs. Rnd 1: K to end. Rnd 4: K to end. Rnd 6: K to end. Switch to stripe color, K 2 rnds. Switch to main color, K 2 rnds. Switch to main color, K 1 rnd. Tie in cast on end and ends from stripes. Add stuffing. Cut yarn and pull tail through remaining stitches. Sew in loose end. Tie in cast on end. Add stuffing. Cut yarn and pull through remaining stitches. Sew in loose end. 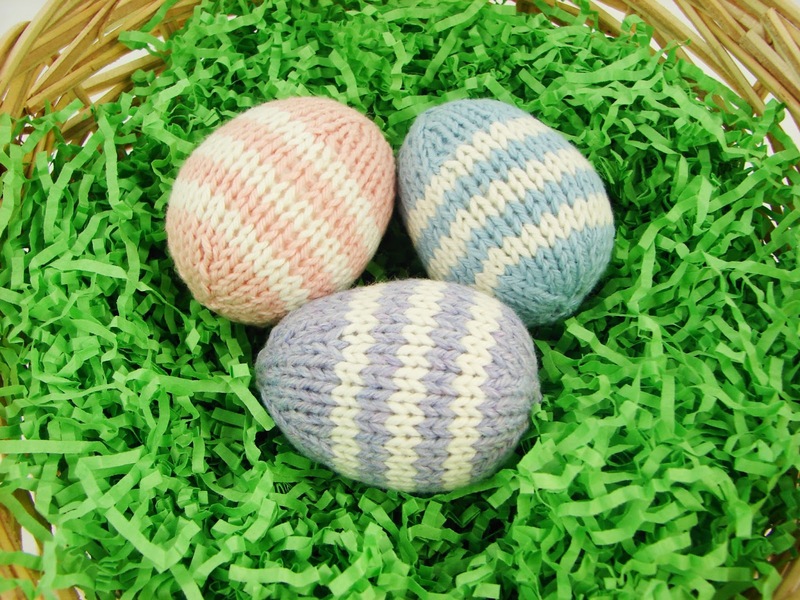 Here are some finished striped eggs in an Easter basket. More finished eggs in a basket, some striped and some solid. This project is a great one to customize. I made most of my eggs in light pastel colors, but bright colors would look great as well. I even did some browns which could be chocolate eggs or natural eggs without dye. 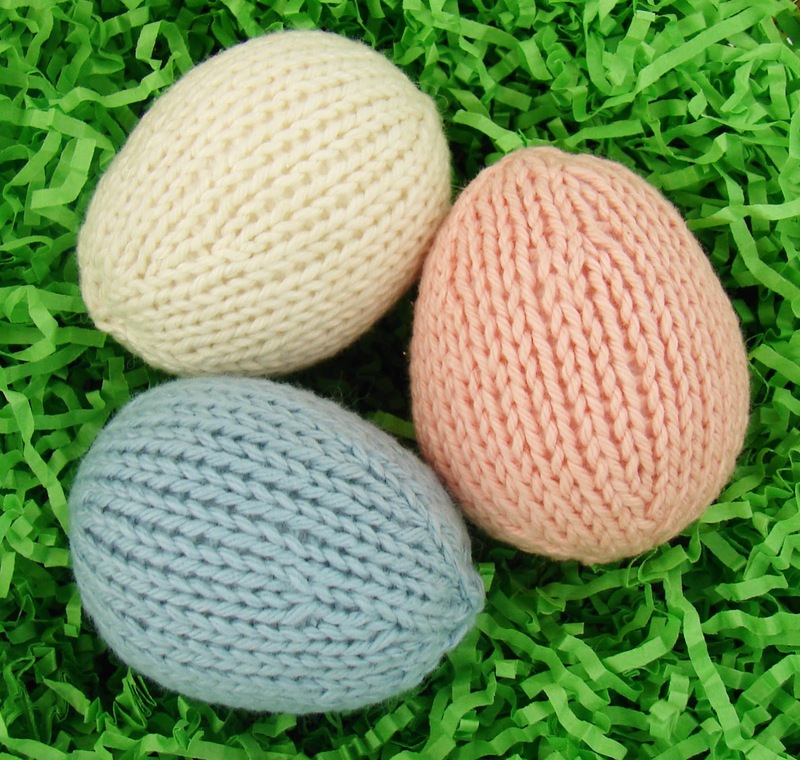 No matter what colors you choose, I hope you enjoy making these fun little eggs! Happy knitting!